at last the new stamp collection has arrived! this collection is inspired by the many picnics i have had during my life. my childhood days at the cottage. we were always on some grand adventure! picnic with our little boys at the park. having our dinner, riding the carousel, riding the train and walking along the river. oh such sweet memories for me! the entire "it's a beautiful day!" stamp collection. that's right it is my biggest collection yet! ON MY BLOG FOR EACH ENTRY. April 24th, 2014 at midnight EST. if you would like another opportunity to win this collection. iiiiiiii, I would really like like like win this giveaway, because I adore your work and your stamps! My favourite image is for now Tucker, but I think I'll found some more in new collection. I was visiting your site and purpleoniondesigns often to see if something new is coming from you <3 Thanks!!! Well, the new stamps are so much fun, but my favourite is still HAPPY-GO-LUCKY! Beautiful new set Stacey! I had to limit the "pool" of contenders to just your stamps because I would never be able to choose a favourite otherwise- even then it's a tie between Peep the bird and Shadow the owl. Have shared on FB as well. Love love love your stamps Stacey and your illustrations! I have liked and shared your Facebook giveaway post! I love all your images. You are so talented but if I have to pick a favorite image it has to be "Rosie", simply too adorable. Thank you for this amazing opportunity to win!!! I love Cedar the fox in the Winter Wishes collection! He is just adorable with his little scarf and hat! I have to say that I like Peep the best. I use that cute little guy in my stamping all the time! Peep is an all-season cutie that I stamp with all the time. My favorite stamp is "Birch"... love the cards I stamped last Winter/Christmas. There is just something about Peanut the Squirrel that has captured my heart, but I love them all!! Can't wait to see all the new designs... 40! Amazing! Rosie is my favorite! She just melts my heart! Hard to choose just one favorite, as Holly is also at the top of my list! They all have so much personality, and are so fun to use in my card creations! Amazing giveaway! My favorite of your stamps is Freckles the frog. He's just so cute, love his expression. This is an exciting giveaway! Of all your images, it's a toss up between Freckles and Peep. My favorite image is Rosie with Peep coming in a close second! Your illustrations are so adorable! Can't wait to see this new collection! You've been busy w/such a large release! It's hard to choose a favorite but I'm going with Freckles! I love his smile! Oh my! What a fabulous giveaway!! I absolutely adore your print "Happy Go Lucky" especially the pig. It just makes me smile when I look at it. Wow, I am so excited to see the new release, just when I said I need to stop buying so many stamps! I don't know if I can pick a favorite, I love all of your images, but from the stamps, I think I would choose Shadow the little owl, or Snowy Trio. Hi, Stacey! I found your site after seeing a share on Facebook and have to say your artwork is just beautiful! I have spent far too much time (that should've been spent cleaning the bathroom!) browsing your lovely website and to be honest find it so hard to choose a favourite! In the end, I decided to choose the image that invoked a memory of my boys when they were small, sticking the carrot nose on their freshly created snowman in the garden, so my choice is Winterberry! Found your cute creations just a few days ago and fell in love with "shadow"...but all your stamps and illustrations and sculptures are so beautiful...so it's hard to choose...thank you for this great chance to win! Oh my....how do you choose a favourite. I have bought many of your stamps and each time I use them....they bring a smile to my face. I love blueberry the most...but all the little accents are so perfect! The stick with the marshmellow, the cabin and the cluster of pine trees! LOVE them all! It's to hard to choose just one of your creations as a favorite. I do love all of the critters you have created for stamps. Especially Poppy! I shared the link to your giveaway post on my personal FB page and on a FB scrapbooking page that I am a member of. Thanks for the chance to win!!! Oh Stacey you´re a great artist and I love each of your amazing stamps! The animalson the top are so awesome,can´t see enough of them,so cuuuuuuuuuuute,just feel in love with them. My favorite image from your collection is Rosie! I've used it for my friends birthday card before! Super cute! This is awesome! Can't wait to see your new collection! I love all your adorable animals - my favourite is Twinkle the Racoon! Very excited about your very generous giveaway! Wishing you a wonderful day! Sorry I don't do facebook or twitter. Love all your stamps,they´re so awesome and coloring them makes me happy! I like working with your stamps,can use them for so many occasions,great! Poppy is one of my favorites. Recently used him for a baby card! I became your new blog follower and pin you on Pinterest too. I so love your stamp designs, I have so many favorites it is hard to decide. A few I can't live without are Birch and Poppy and Shadow :) . Thanks for the chance to win. https://www.facebook.com/janet.durbin.31?fref=nf Facebook link to my post. Hard decision. I guess Poppy is my favorite image. My favorite image of your from Purple Onion is Birch (winter bunny). I just love little Birch with that big ol' hat! 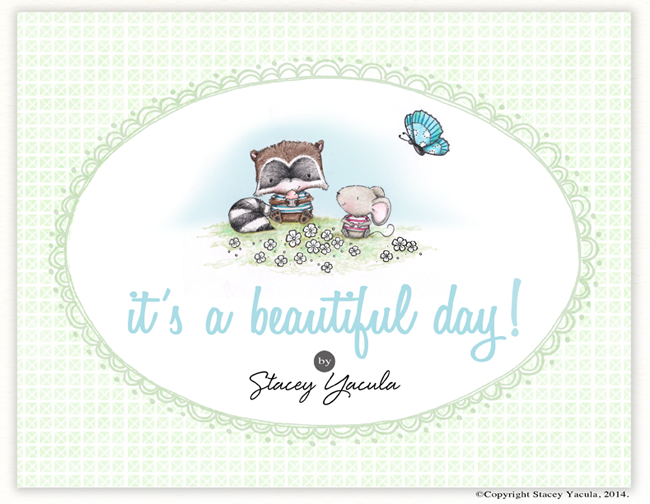 I love your artwork Stacey and am so glad you are sharing some of it in your rubber stamps! Yay! I don't know how to provide a link to my Facebook but I follow you there too. New collection? I want 'em! I love Peep or any other of the little birds. So cute. Thanks for your generosity. My favorite of your current stamps is "Birch" I think. SO precious! l love the bunnies Birch and Buttercup. OMGosh, Stacey, I hope there is a panda invited to the new stamp picnic :) Love your stamps and can't wait for the reveal. I'm crossing my fingers that I might win. Congratulations to you. I am so very excited about your new stamp release! My favorite character of your many has always been "Peep." However, among your winter characters I have probably used "Snowy" the most. Now that it is finally spring, I must say that your "Spring Bloomers" may have taken over my favorite spot! They are beyond adorable and hopefully will be among your new stamps! Congratulations on the new release... I truly cannot wait to see it/them! Thank you so much for sharing your talent with us in stamping form. My favorites are your owls. There is something so appealing about their faces! Although I could say that about many of your animals! So excited for the new release. Thanks for the opportunity to win the set! It's so hard to choose just one as a favorite!!! All your critters are just so stinkin' cute!!! I love Frost and Birch! Totally adorable!!! I still love Tucker and my nephews do, too! But all your designs are fantastic and I'd love to own ALL of them!! Oh my gosh! I don't know how to pick just one! I LOVE your little critters... if I have to choose one of my favorites is the greeting card with bear moon and star... such a beautiful image... but really I LOVE all you do! PEEP is my all time favorite stamp image! It's so hard to choose just one! I love all of your images: the sweet little animals, the cutest flowers, the darling balloons..... and on! Rosie is one of my most loved. They all make my heart feel happy! Thanks for sharing your talents with us. I'm so looking forward to the new release on Friday (it's my birthday *hehe*). I love your cute images and one of my favorites is Poppy. Oh my goodness, Stacy... Birch, Frost, Icicle, Holly, Santa how can I possibly pick just one favorite! I have several of your stamps and really enjoy creating with them. Their happy expressions are so fun to design with and always bring a smile of delight to the card recipient. Looking forward to your new release! I don't have a twitter or Facebook account, but I did sign up to follow your blog. Thanks so much for a chance to win this new release, such a generous gift! I love your designs!! Oh my goodness I want everything!! I can't choose just one! I love Icicle, Juniper, and Silver from your stamp collection. They're just too cute. Can't wait to see your new release!! I just love everything you do but I adore your Shine Bright collection. Would love to see some bear stamps. Can't wait to see this collection!!! I just love your images, they are so fun to colour. I only have few of your stamp images but I think my favourite is Buttercup and Timber. Can't wait to see what you have created for your next collection. Oooh what a wonderful wonderful thing to give away, how exciting, my favourite is Shadow, adorable. Stacey, I can't wait to see your new collection! I just love each and every one of your designs, but the set I keep grabbing is the the Sweet Offerings Set and Peep... your birds are the sweetest of all times! Thank you so much for this wonderful "Christmas" gift! I just discovered your artwork today! I LOVE IT!! When I browsed through your stamp line my immediate favorite was Blueberry Bear (I've a weakness for bears), but then I saw Puddles the dog (another weakness) and Shadow (owl!).... sorry, I cannot pick a definitive favorite - I just have to have them all! i am placing an entry for "McStamper" on Etsy who was unable to post on my blog. i have heard that from a few people and I am sorry I don't quiet know why. Needless to say she wrote to me and here is her entry for her favourite image. "#1: I love everything you do but since I am such a snowman fan, I love your Snowy Days print and the ornament." here is "McStamper's" 2nd entry. my favorite is Icicle the little polar bear - so very cute. I love all your designs and really look forward to seeing the new collection. Until now I just have "winter" animals (and trees, snowflakes, snowmen, etc.) and I love all of them, I could not say which one is my favourite. I just like all your images, they are all so cute and I especially like that you have so many different images that can be used to stamp scenes. Shared this giveaway on facebook. Barbara W.
It's hard to pick one image, all of them are adorable. The little snow men are some of my favorite winter ones. Thank you for the chance to win this amazing blog candy! How can I choose only one? Oh my, oh my but since I have to, well, its Rosie :-) Thanks for the chance. Awww I just found "Flower Parade" and I ♥ it. I soo love turtles! I'm really excited to see the new stamps. Puddles is so cute. All you designs are adorable. I do not think I can choose just one; all of your designs are delightful. Birch and Peep are way up there. I can't wait to see our new creations. Pick one that is just crazy pick two getting better..come on I love them all.Ok of the ones I currently own my fav is Shadow!!! Oh my goodness - just ONE favorite? That's impossible because I love them all! But if I had to pick just one image to have that is my absolute favorite because my heart just melts when I see it, I would say its Buttercup the Bunny. So adorable! Stacey, I love your stamps, especially the animals. The fox in the winter hat is my favorite. : ) I have him and several other winter ones. I can´t wait to see your new collection:-)) I really love all of your animals but my favorite is Poppy. Oh gosh, I am totally in love with your designs! Love all the cute critters but your Whale and Bird wall print just blew me away. LOVE the whale and the waves! I love all the animal stamps especially the owls, birds and rabbits. Some weeks ago I ordered my first stamps of the first collection I can't wait to get them. It's just about impossible to pick a favorite but I love foxes, so Cedar is one that I love. I also love all your cute bunnies...especially Poppy! That is like asking us to pick a favorite child haha! I love Puddles but I love everything you make! I have also shared on facebook. Thanks for such a wonderful stamp line! I love all of your images-but especially your winter collections for my Christmas cards-the trio of trees, the stockings, Filbert the penguin, and Berry the snowman. Love them all! All of your designs are delightful, but I would have to save "Peep" is my favorite! I cannot wait to see your new collection!!! I love your stamps.. Have several (but not enough) : ) Hard to say which one I own that is my favorite.. they all are.. but I will go with the one I have used the most which is : Frost.. : ) Thanks for the giveaway…. I love your art very much! Espescially sweet is Timber, the beaver. I love to see your work again and again. All of the images are so darn cute but I have a soft spot for Shadow the Owl! Oooh what a wonderful wonderful thing to give away, how exciting, my favourite is Owls adorable. The owl is my favourite! But I absolutely LOVE all of the background features like the hills, birds, kites, branches, wreaths etc, that make a scene perfect all in your design! Your drawings are JUST AMAZING. I love all the animals but the little raccoon with the ice-cream is so incredibly cute! UNBELIEVABLE. And I love that the set will have so many images, that makes it EXTRA super as well. Please continue to make more because we are all going wild over your truly awesome work....what a gift you have! Thank you for the new release and this great giveaway; you made my day!